Nothing can stop the aging clock and its effects on our skin, sooner or later.Derma roller is a unique skin rejuvenating therapy to brighten and even out the skin tone. It is a safe, fast and pain-free way to a smooth, supple and flawless skin. Dermaroller is a titanium device consisting of a rotating wheel with fine embedded needles (1.5mm), that is rolled over the skin to create thousands of tiny contact points. This causes the skin to create a wound healing process and pave way for a clear and radiant skin. The derma roller stimulates the production of collagen and elastin giving rise to the growth of new capillaries which improves the blood supply to the skin. Your therapist will apply a topical anesthetic cream and clean the area to be treated with an antiseptic solution. A sterile, single-use roller with microneedles will be used all over your face (until the end points of pin-point bleeding, redness and mild swelling) creating micro-traumas that will jump start your body’s collagen production. A specific nourishing serum will also be infused in the needles in order to enhance the cell regeneration process. The session lasts for 15-20 minutes after which the area is cleaned with a soothing cream and sunblock applied. Dermaroller facial treatment harnesses the natural qualities of the skin, giving it a little boost to keep you looking refreshed and rejuvenated. The Dermaroller uses a network of micro-needles, gently rolling over the surface of your skin, to deliver an intense hydrating serum to the deeper layers below. The tiny punctures on your skin stimulate your body’s natural ability to heal, encouraging the growth of fresh, new skin cells and collagen around the area. The treatment is highly effective at tightening lose skin and smoothing out fine lines and wrinkles. Dermaroller treatment is a personalized treatment plan that is tailored for the individual. To preserve the uniqueness of every client aesthetically, we offer each patient a customized plan to cater to his/her unique face and issues. You should expect some redness and sensitivity after the treatment that will soon subside leaving you with a more plumped, rejuvenated complexion. The red and flushed skin after the procedure is a normal sign that the treatment is working and it subsides within a few days. SPF 30 and the effective daily skin care regime prescribed by your consultant is crucial to help promote and achieve optimum results. The efficacy ranges from one to four sessions at intervals depending on the severity of scars and condition of the skin. Improvements in skin texture and tone may substantially start becoming visible within a week onwards after the initial treatment. The treatment can last up to 75 minutes depending on the areas you want to treat. A course of four to six treatments is recommended, with results showing gradually throughout the duration of the course. Your practitioner will be the one to assess the exact amount of treatments according to your skin’s needs and progress. You should expect some redness and sensitivity on the treated areas that will soon subside leaving you with a rejuvenated complexion. Your practitioner will assess the exact amount of downtime needed according to the intensity of the treatment.Dermaroller involves minimal downtime (up to 5 days) in order for your skin to fully recover from the micro traumas. 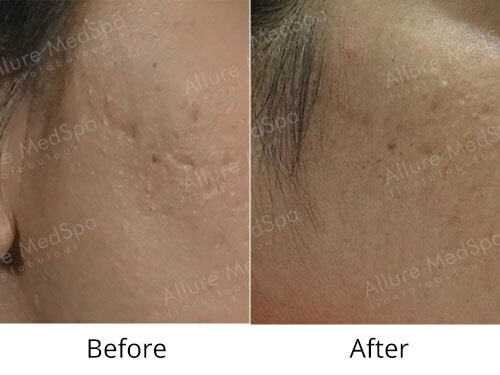 Allure MedSpa which is renowned for its state-of-the-art internationally acclaimed services, offers affordable and cost effective Face rejuvenation and Skincare procedures. Your consultation is your chance to ask questions about Face Rejuvenation treatments and put your mind at rest. Our surgeons and cosmetologists will be there to offer full explanations and answers to all of your queries. Being in fairly good health and having realistic expectations is an essential pre-requisite for any cosmetic treatment. We are pleased to offer and arrange comfortable lodging, restaurant, and commuting to ensure a memorable pre-and post-treatment experience for our out-of-country patients. Please feel free to contact the Counselor via +91 8291863159 for assistance with any of your travel and planning needs. What areas can be treated with Dermaroller? Dermaroller works great to reduce fine lines and wrinkles on your face, neck and décolletage. 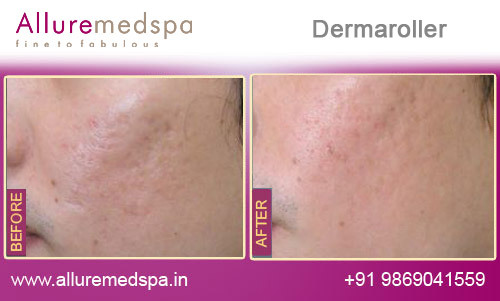 Because of its regenerative powers Dermaroller is also a great treatment to fade out acne scarring. What is the relation between Dermaroller and Collagen? Collagen is a protein, it works with other proteins, hormones, and natural substances to hold skin together while still giving it a certain bit of elasticity. That way it has the ability to expand or contract, sort of like a balloon. The aging process naturally causes production of all of those substances to slow down, making the elasticity go out of your skin a bit. That’s what leads to the development of annoying wrinkles and sags. That’s when therapies and treatments like Dermaroller become necessary because it helps our body to generate more collagen naturally. How does Dermaroller work to reduce Acne Scars? In the case of acne scarring, one thing that can cause the scars is uneven collagen distribution. It’s possible to still have plenty of it, but not have it going to the right places. That can cause a build-up of scar tissue. If you have less collagen than you should in a certain spot, it can cause depressions in the skin’s surface, or indented scars. Dermaroller doesn’t just encourage more collagen production, but also helps the collagen to be distributed evenly. Dermaroller therapy uses micro medical skin needling to stimulate collagen and elastin production in the skin causing the skin to regenerate and repair itself naturally. The Dermaroller is a simple hand held roller with 192 micro needles, when rolled over the skin the Dermaroller parts the pores in the upper layer of the skin producing thousands of micro needle columns. How does Dermaroller therapy work? Before the procedure a thin layer of anesthetic will be applied to numb your skin, this will make the treatment more comfortable and pain free. As the skin roller is rolled over your skin, it creates pin point punctures into the dermis temporarily forcing the pores open. Once the Dermaroller treatment is complete the body reacts by producing collagen and elastin which will cause the skin to regenerate and repair itself. How long does a Dermaroller treatment take? Dermaroller therapy treatment usually takes between 20–30 minutes. You will also need to allow 30 minutes for the an Dermaroller esthetic cream to take effect. How long does it take to see the effects of the Dermaroller therapy? After the Dermaroller treatment the body will start to repair and regenerate the skin, however it takes time before new collagen is formed and new cells are generated. 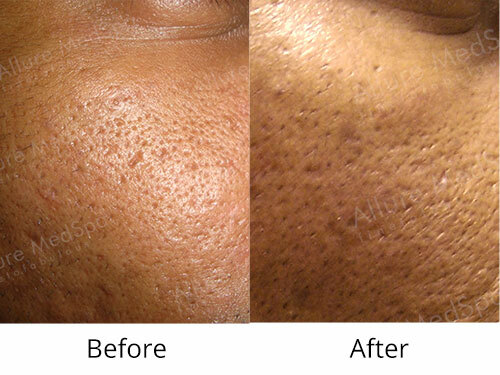 Typically, the results of Dermaroller therapy will take up to 6 weeks before there are visible signs of regeneration. We would usually recommend that 2–3 treatments will be required; however this is subject to consultation with a Allure medspa clinician and dependent on the condition being treated. How much does Dermaroller therapy cost? For an estimate on how much Dermaroller therapy may cost, we recommend that you call Allure medspa on +91 22 26732961/62/63 for our latest Dermaroller therapy prices. For specific information based on your individual needs, we will be happy to arrange a consultation. 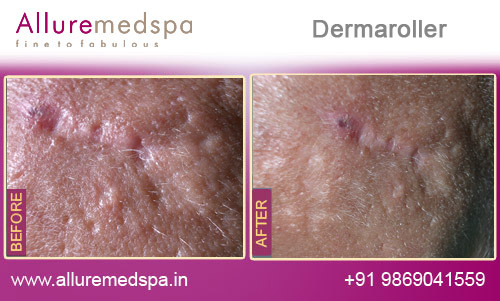 Allure medspa is the India’s leaders in Dermaroller therapy — call us today on +91 22 26732961/62/63 to order a brochure or arrange a consultation with a cosmetic treatment specialist.